Two young pups wait to be adopted during the Palm Valley Animal Center Clear the Shelter 2018 event on Saturday, Aug. 18, 2018, in Edinburg. You have to admire people who give up large amounts of their time, effort and even money to care for homeless animals. Dozens of them live in the Rio Grande Valley volunteering at local shelters or taking home animals that need medical care, rehabilitation from injuries or emotional support. Their work helps find homes for animals that have been abandoned by previous owners or found wandering the streets, and their efforts were on display last week in Edinburg, Port Isabel and Sullivan City. 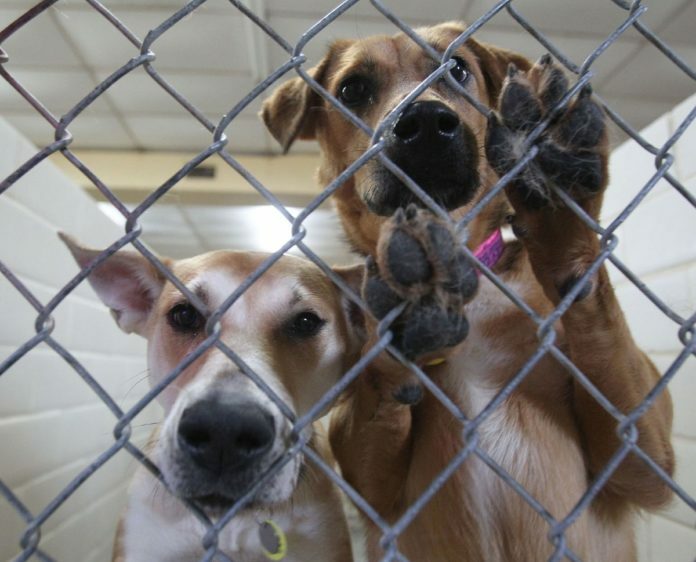 Centers there joined hundreds of others across the country in a nationwide “Clear the Shelter” effort to find permanent homes for animals in their care. Clear the Shelters, a national pet advocacy group that promotes the national adoption campaign, reports that since the Aug. 18 event, some 92,000 animals have been adopted nationwide. Several hundred of those placements were from the participating Valley shelters. Other local shelters frequently hold similar adoption campaigns throughout the year, often with valuable assistance from local pet stores. They all deserve our praise and support. Animal shelter workers and the volunteers who help them provide valuable services to our community. Every animal they can place in a new home is one less animal they have to euthanize. That’s a major consideration, as many cities are trying to institute “no-kill” policies. It’s a big challenge, since dozens of stray animals are pulled off our cities’ streets every day. A commitment to not killing any animals could lead to overcrowding if the shelters can’t place enough of them in new homes. These animals, and the people who tend to them, could use a little help. Families who are looking for a new pet should first turn to their local shelter; chances are, they’ll find a great match. Several law enforcement agencies are setting an admirable example in this regard by adopting shelter dogs and training them to search for drugs and other contraband or missing people. For private homes, people who already own pets should take proper care of them, and abide by local ordinances such as ID tag, vaccination and electronic chip requirements. People looking to adopt pets, regardless of the source, should research the animals to ensure that their new pet is a good fit for the family. Many shelter animals were taken there because their personality didn’t match the family’s preferences, or were bought as puppies and grew too big for the family to handle. Some breeds are docile and are perfect for people who like things quiet. Other pets are active and friendly and make great companions for children — unless they are large dogs that can overpower smaller children. Thus, families should inform themselves of the tendencies of animal breeds before they decide which pet to adopt. Ask shelter workers about a specific animal’s personality. Knowledgeable selection can reduce the likelihood that an animal will be returned to a shelter because things didn’t work out. Adopting a pet from a shelter can bring years of companionship that enriches a person’s life. And it will bring welcome satisfaction to the many shelter workers and volunteers who made that union possible.